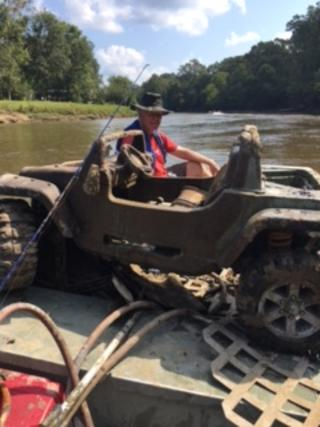 ​The writer proudly displays a trophy, a water-logged 4-wheeler extracted from the Pearl River, in a boat skippered by river-side resident Kyle Jeansonne. This was a small, though heroic, part of an amazingly large volunteer effort during one day in September to clear piles of litter and junk out of the four-hundred-and ninety mile stretch of the Pearl from Neshoba County, Mississippi to the Gulf of Mexico. It was put together through the collective efforts of a great organization, Pearl Riverkeeper. Everybody got muddy, even Tubby.